Cooking Friends » General Discussion » What's Cooking This Month? » SEPTEMBER, 2018 ~ What's for dinner / supper??? SEPTEMBER, 2018 ~ What's for dinner / supper??? I think this is the third time that Charlie has asked for this dish. It's Kiebasa and cabbage. He also asks for the noodles. NormM wrote: I think this is the third time that Charlie has asked for this dish. It's Kiebasa and cabbage. He also asks for the noodles. Delicious looking Norm .... I love noodles like that. Chili with beans today. French's Chili O Mix! Horrible..... Friendly's chocolate brownie ice cream. Tina grabbed it by mistake. My sister and I went to a "New to us" Chinese restaurant. Apparently an authentic Chinese menu. Gorgeous, calming interior, definitely not the standard red/gold interior that so many places have. They had a Dim Sum menu, and regular menu. I had sticky rice with pork and shrimp wrapped in a lotus leaf; some snowpea shoots with crabmeat sauce, and some grilled octopus. Hot and sour soup to share, and Jasmine tea. Portions were large, service friendly, we'll be back. Everything was yummy. The octopus portion was so large I couldn't finish it. It's today's lunch. Lore, I want to go to that restaurant with you and your sister! Jimmy, the cornbread was horrible??? I make Jiffy Mix cornbread all the time......I love it. Sometim s I make it with buttermilk, other times just regular milk. I like to split the leftover bread, toast it n the toaster oven or butter and griddle - then drizzle with clover honey. YUM! bethk wrote: Lore, I want to go to that restaurant with you and your sister! Come on up! I'll treat. bethk wrote: Jimmy, the cornbread was horrible??? Horrible..... Friendly's chocolate brownie ice cream. OMG.. Still dealing with Renovations.. spent all week, living with a friend~~m in a 600 sq ft apartment.. I was gone all day.. as was she.. but still.. I slept on a sofa bed... It was weird..
and so hot in there.. and so loud.. So glad I took the time and expense, to tarp and blue tape down, all my furniture!!! My extra bedroom is a war zone ~~ with all the stuff from the kitchen cabinets, and 2 bathrooms.. It looks really nice.. a few things are not in alignment... sigh..have to inform the idiotic/condescending proper manger about these... sigh..such a A=-hole. Thanks, Cyn....Huck was the best dog our daughter could have had. Made cream of broccoli soup from leftover broccoli and som Jiffy cornbread.....wonder how I thought of that??? Last cooking I'll be using. Tomorrow all of Robins stuff is out of here. I don't want to wait until the last minute to get the last of the wiping up done. We'll just keep the coffee pot and our coffee mugs....we'll toss 'em when we drive out! We said we can go out for a breakfast and get carry out for suppers between now and Friday when we hit the road. We have a few dinners out scheduled with friends so it's not going to be a terrible imposition. Us too. Usually just vanilla / chocolate / or butter pecan. Today, it is so easy to pick up the wrong thing. chocolate / vanilla / and strawberry. Wow! Neapolitan ice cream. We used to eat only the chocolate and vanilla. We have a pint of Ben & Jerry's chocolate brownie ice cream in the freezer. I don't really care for it either. I like Baskin Robbins. They have a chocolate and vanilla mix that is tasty. Out here we have a grocery called Ralph's. It is part of the Kroger chain. They have something called Private Selection chocolate ganache ice cream that is very good. My husband's favorite used to be marble fudge. I don't see it any more on the shelves. I am picky about my ice cream. There are only certain flavors and brands I like. I am pretty much a chocolate and vanilla gal. I was reading a tip from Real Simple magazine about de-cluttering your kitchen. They said if you haven't used something in two years, toss it. I tried to take their advice and tossed nothing even if I haven't used it in two years. I keep thinking I might need it - like a nutcracker, apple corer, bean stringer, various scoops, things like that. Just couldn't toss 'em. Tonight was a rotisserie chicken in my Ronco, cold green bean salad with bacon, blue cheese, red onion, tomatoes and balsamic dressing and a box of Noodle Roni. Tomorrow I will have leftovers while Katie and Joe have smoked salmon, cream cheese, capers, red onion, dill on a bagel. Just pulled out of the oven early this morning. 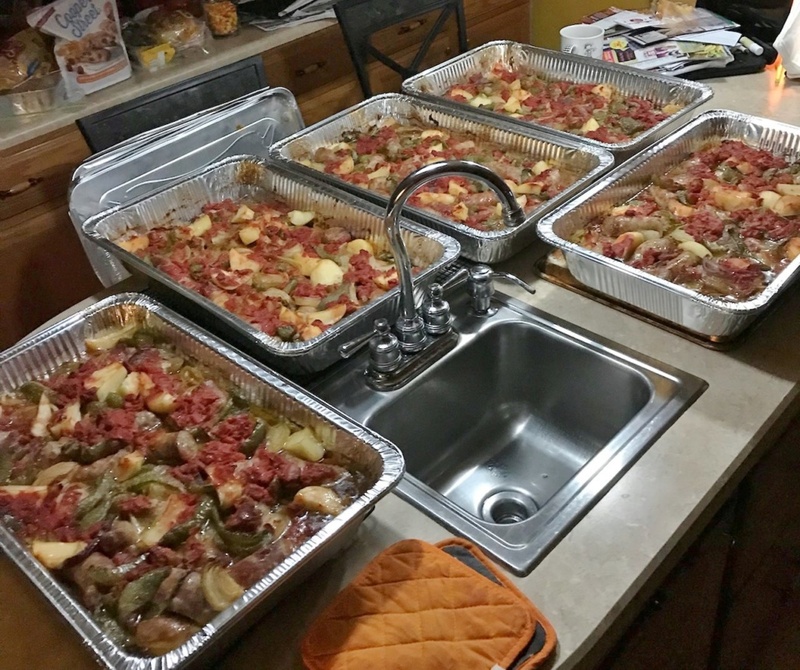 The sausage and peppers, potatoes and onions for the church festival this afternoon. Tina volunteer to help cook and donated the sausage. 60 pounds of it! She's working the festivities now. WOW! That's a lot of work. You wo are such generous people. Bless you both! bethk wrote: WOW! That's a lot of work. You wo are such generous people. Bless you both! Thanks Beth. Yes! We didn't care about pitching in for the church, but the Bishops and the diocese giving has stopped. Now with the problems the church is having, support is for the church we attend... period! The festival this day, was a fundraiser for repairs and a new roof on the church! Supper tonight, is leftover rice from the church festival. Cookies and brownies, and sweets. Actually, the cooking compliment is due to DD. Ha Ha,.. what do you have? That travelers suitcase, with the leather straps; and inside is the single electric burner cooktop. Cans of pork and beans, and canned soups. Saltine Crackers, and a jar of Nescafe instant coffee. Come to remember, I remember as a kid, waking for school, and Mom and Dad, and brother, and myself, would be the ritual of toast and margarine, and Nescafe instant coffee. 3 tsp sugar, and milk. Then, later, the came out with the instant coffee crystals. OMG, everyone complained about the taste; that I remember. Tea, was always Lipton; with the tiny little tea leafs, in the flow through tea bag. Arthur Godfrey Show, had Lipton as his sponsor for years. My mother loved that show! That and the Art Linkletter Show. Oh Well, back to the present! Ditto for me on the dish and the noodles, Norm. Don't you just love when someone ASKS you to make something? It's such a good feeling, I think. Beth, so sorry to hear about the loss of your family dog. God, it hurts. Thank goodness Huck died on his own, as it's SOOO hard to take a pet to get it put to sleep. We had a cat Gracie who we'd had for years, probably 13. She lost most of her vision we think as she aged and I'm pretty sure her hearing wasn't what it used to be. I'd taken Thanksgiving week off (my favorite holiday) like I always did to get a jump on cooking as we were having a decent amount of people that year. Gracie started having some more problems and I thought I'd have to put her to sleep that week. I cried and held her on my lap for a while, talking to her, and asked her to either please hold on with no noticeable problems until the following week as I didn't want to be sad. I also told her it was okay with us if she wanted to just give up and go to the Rainbow Bridge, as she'd had a nice life, she'd given us a lot of joy and laughs, I didn't want her to suffer and to please not make me have to put her to sleep. Brian got up first the next day and found that she'd died in the night. I was so grateful to Gracie as it was hard enough losing her that week but I'd have been a wreck if I'd had to put her to sleep. Again, Beth, I'm so sorry for your loss. UNCLE JIMMY wrote: Just pulled out of the oven early this morning. Boy, that sausage dish really looked delicious, Jimmy! How nice of you guys and DD to help out. And Tina was a sweetheart to give of her time at the Festival, too. I stopped at the grocery last week (a different branch of the same grocery we shop at) to pick up a few things and walked out with almost a full cart of food as usual. They had a huge chicken in the case where they sell pre-prepared food items for you to take home and cook. This was a 6.5 lb. chicken that they said was injected with butter and Creole seasoning. It looked really good and I love a big chicken whenever I'm going to roast one. I spatchcocked that sucker (just got some new kitchen shears that made easy work of cutting out that backbone), left it out of the fridge for an house and then just plopped it on a half-sheet pan I'd sprayed with non-stick spray. Figured since it was butter injected and seasoned, I really didn't need to add anything other than putting a big bunch of fresh thyme sprigs and a big sprig of rosemary fresh from the garden under the chicken on the pan for some added flavor. Decided to cook it higher for a half hour and then reduce the temp so I started it at 450F but I used the Convection Roast setting so my oven automatically lowers the temp to 425F. After 30 minutes, still using Convection Roast, I lowered the temp to 350F (325F) and cooked it for another half hour. When I tested it with the Thermapen, the breast was fine on one side but the other side could use a bit more and the thighs were testing done. So I turned the oven off and put it back into the still hot oven for another 20 minutes, when all the temps were in order. Boy, was that chicken good! Perfectly seasoned and extremely moist and tons of breast meat, too, which Brian loves. The drippings on the tray were delicious too which I hadn't expected. We wanted crispy skin so I didn't baste it and the drippings were nice and dark and thick with just a bit of oil showing in them. I'd made jasmine rice to go with it and to put Brian over the moon, I made some tarragon cream sauce. So I used the drippings just as they were on top of our chicken and the cream sauce went on the rice. Veggie was boy chok, sauteed with bacon, onions and red pepper flakes. Delicious meal and tons of meat left on that chicken, too. Like an idiot, I forgot after putting that chicken in my cart to go back to where I'd picked up the rotisserie chicken and put that back on the shelf. So we ended up with that chicken, too. Brian was sweet as he picked all the chicken off the rotisserie chicken and after a second dinner from the spatchcocked chicken and also two chicken sandwiches from it, he picked that meat off, too. We took out the big bag out of the freezer marked "chicken stock" that I'd put the backbone in and with the bones from those two chickens added to the frozen ones, made a big pot of chicken stock. I just have to strain it today and reduce it more, as I like that "double chicken stock" flavor. I'd buy that big old chicken again in a heartbeat! Cooked a lot faster than I thought it would even with the spatchcocking. And it smelled so darn good while it cooked, too. I divided all the chicken into smaller portions for different meals and sealed them in the FoodSaver. God, we love that gizmo and wish we would've gotten one years ago.I bought a pound of strawberries the other day and knew we wouldn't get to them for a while so I sealed them in a FoodSaver container with Brian looking on as to how to use the container. He cleaned them yesterday and they didn't show a bit of age even though they were four days in the fridge already. Cindy, so sorry you had to endure all that mess in getting those renovations to your apartment. Lord knows I know how much dust created by HALF that work done in my own kitchen so you were brilliant to cover your furniture. It's a shame your rent went up but boy, they sure replaced a lot of stuff. I can only imagine how much you're hurting as I know I'd have never been able to do what you did. Brian either. I think moving the stuff out of the way and putting it back would've killed me. I know what you mean about your bedroom looking like a war zone as we STILL don't have our living room in order. Something came up so I have yet to call the man to come work on our windows (historic district so we have to get someone who can repair old windows; found the guy, just hope he's available when I call him soon to come out to see what he can do and for how much)! Don't do too much at one time and hurt yourself. Just commit to a couple of hours of work and then stop. It'll get done even if you do it on the slow bell. Hope it's at least fun to enjoy your new kitchen and baths! 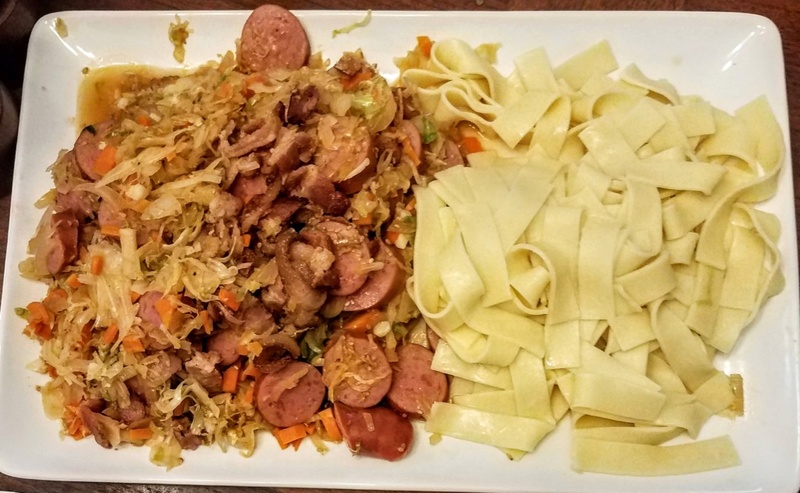 126 Re: SEPTEMBER, 2018 ~ What's for dinner / supper??? Select a forum||--Welcome To Cooking Friends| |--Welcome To Cooking Friends| |--General Discussion| |--Talk About Food!| |--What's Cooking This Month?| |--Holidays and Celebrations| |--As Seen on TV!| |--Equipment Corner| |--The Old Homestead| |--Outdoor Cooking| |--Recipes and Methods by Title| |--Sweets and Confections| |--Breads| |--Casseroles and Main Dishes| |--Meats, Poultry, Seafood| |--Vegetables and Salads| |--Appetizers and Drinks| |--Odds and Ends| |--Chat Room (non-food related talk)| |--How's Your Day?| |--Family and Friends| |--Forum Issues |--Problems or Comments?